Elihu Vedder first studied art in his native New York but traveled to Europe in 1856, enhancing his education in both Italy and France and beginning a life-long fascination with European art and literature. He eventually established his studio in Rome and lived as an expatriate in Italy for over sixty years. A poet and writer as well as a painter, Vedder had been fascinated with ancient myths and fantastic tales from the very beginning of his career. He developed a particularly strong following in Boston, which since the early part of the century had cultivated a taste for Romantic, literary paintings. 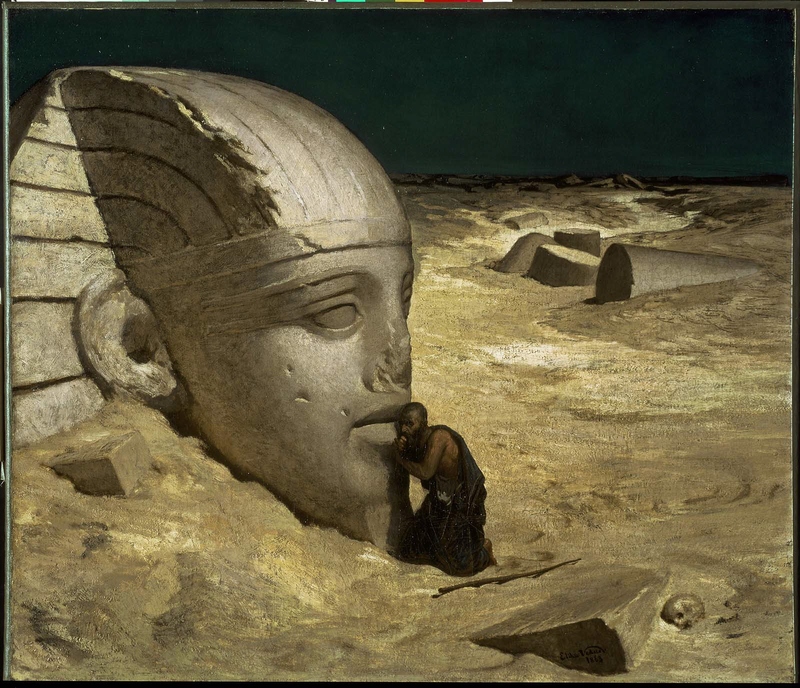 The Questioner of the Sphinx was exhibited in New York in 1863 and was purchased immediately by a Boston collector, Martin Brimmer, for $500. Vedder, then in his twenties, had not yet visited Egypt when he painted this mysterious work. Depictions of the Great Sphinx at Giza (or Gizeh) had appeared in a number of travel books by the mid-nineteenth century, when imagery of the Near East became increasingly popular; Vedder seems to have used such an illustration as a source. However, the subject of an Arab wayfarer questioning the mysterious monument came from Vedder’s fertile imagination, although it does recall the ancient Greek myth of the sphinx that protected the road to Thebes by challenging passing travelers with riddles. Vedder’s pilgrim, in his ragged robes, appears to have made a long and difficult journey through an inhospitable wilderness in the hope of hearing some great truth from the implacable statue. His success is uncertain, for the skull of another questioner lies in the foreground, a mute witness to the occasion. Broken columns, remnants of human activity, lie strewn in ruins, almost buried by the shifting sands. Vedder wrote that, in this painting, he sought to portray the hopelessness of man before the laws of nature; to the modern viewer, it also resonates with the uncertainty that accompanied the Civil War. Vedder continued to be haunted by this subject and he produced a number of other images of the sphinx over the course of his long career.